Steel often gets all the glory, but aluminum also had a big year. 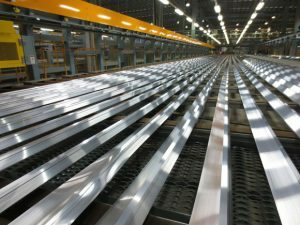 From the U.S.’s Section 232 tariff announcement to the April aluminum price spike after the U.S. Treasury initially announced sanctions against Russian firms and their owners (including aluminum giant Rusal), there was plenty going on in the world of aluminum. On the sanctions front, the U.S. Treasury announced it would delist several Russian firms previously targeted with sanctions (however, as MetalMiner’s Stuart Burns noted, the aluminum market reacted with a bit of a shrug this time around). Well, that was something and nothing, wasn’t it? The non-event of the month was the U.S. Treasury Department’s Office of Foreign Assets Control (OFAC) announcement this week of its intention to end sanctions on En+ Group plc, UC Rusal plc, and JSC EuroSibEnergo, all vehicles associated with Russian oligarch Oleg Deripaska. Deripaska remains on the sanctions list. 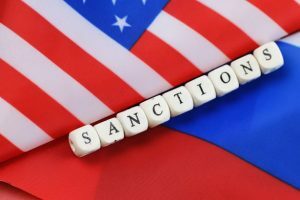 However, following his nominal separation from the firms, OFAC decided to end sanctions. Deripaska is reported to have put plans in place to reduce his shareholding in holding company En+, which is currently 70% to fall to 44.95%, while a Russian bank will take title to a portion of Deripaska’s shares, according to Aluminium Insider. The article states Deripaska will also be required under the agreement to hand over shares in En+ to charitable foundations and assign voting rights above a 35% threshold to a voting trust. Other shareholders deemed to have a familial or professional relationship will be compelled to do the same. Once the entire plan has been executed, En+ will retain ownership of 56.88% of Rusal, with Deripaska’s stake reduced to 0.01%. 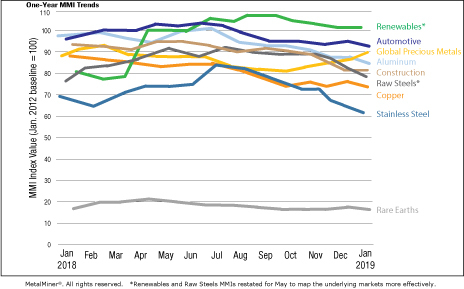 That’s good news, aluminum buyers may retort, and yes, it is in terms of finally settling a source of some disquiet that has been underlying the market since May. 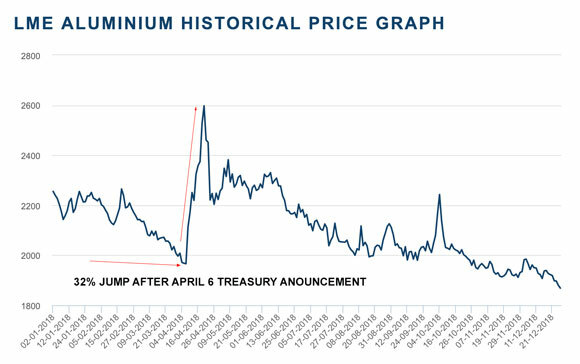 But the fact that the aluminum price barely moved underlines the reality that the market had long expected this outcome — and barely reacted, accordingly. What happens next year remains to be seen. The whole metals complex has been at best trading sideways during the second half this year, buoyed by decent demand but depressed by worries about global growth and trade wars. The lifting of sanctions frees up some 200,000 tons of Rusal primary metal sitting on the LME for consumption, and potentially 10 times as much sitting in off-warrant or off-market stock and finance trade storage. The LME metal is unlikely to go anywhere fast. Currently, the LME supports rollover of maturing stock and finance trade contracts with two-year forwards at a sufficient premium to one-month forward to facilitate extension. As such, the market is not going to be flooded with Rusal metal that would cause a further weakening of prices. That clearly is the market’s assessment, too, otherwise prices would have fallen significantly after the announcement. This morning in metals news, the U.S. Treasury Wednesday announced it will lift its sanctions against companies owned by Russian oligarch Oleg Deripaska (which includes aluminum giant United Company Rusal), Chinese steel prices hit a five-week high and Alcoa cuts aluminum production amid a labor dispute at its Becancour smelter in Quebec. On Wednesday, the U.S. Treasury Department announced it would delist several Deripaska-controlled companies, not long after previously announcing a sanctions deadline pushback to Jan. 7. 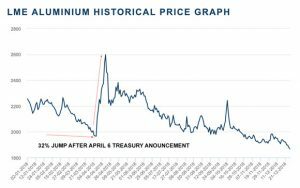 MetalMiner’s Take: LME aluminum prices have increased slightly today on the news knowing that the Trump administration will lift sanctions on Russian companies owned by oligarch Oleg Deripaska. However, the increase does not appear sharp. 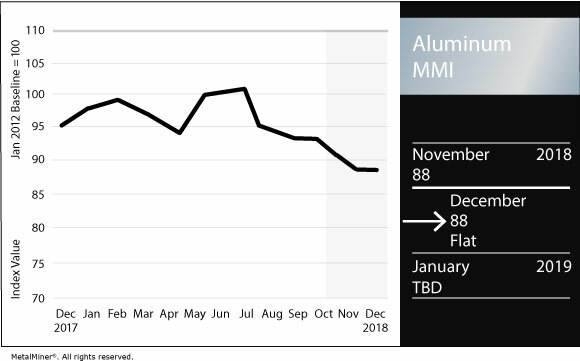 Prices increased following the previous pattern, and aluminum prices are still lower than they were at the beginning of the month. 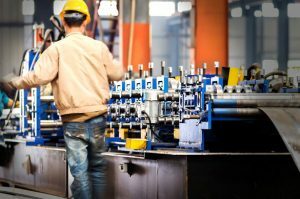 This decision will not have a large impact on the aluminum market. 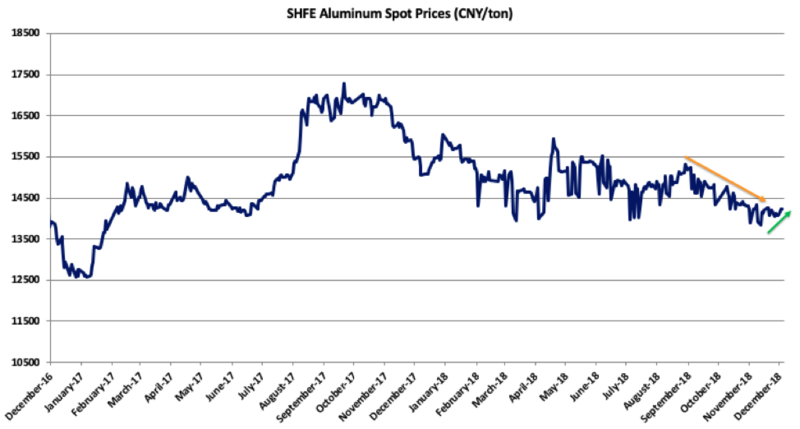 In April, when the sanctions were announced, the aluminum market felt constraint regarding supply; prices subsequently spiked. However, current market conditions are far different from April 2018. Crude oil prices are lower, commodities are decreasing and the U.S. dollar is rising. Also, Section 232 and all the other tariffs still remain in effect. 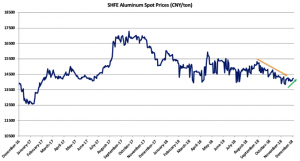 Therefore, buying organizations won’t see dramatic changes in LME aluminum prices, in both the short and long terms. Alcoa announced Wednesday that it will cut production by half at its Aluminerie de Bécancour Inc. smelter in Quebec. Alcoa and the union representing its workers still remain without a labor agreement almost a year after the other two potlines were curtailed. According to Alcoa, curtailment of the one operating potline will begin Friday, Dec. 21. Chinese steel prices, which have lagged of late, rose to their highest level in five weeks, Reuters reported. Shanghai rebar steel prices rose as much as 1.8% Thursday before settling up 1.5%, according to the report. 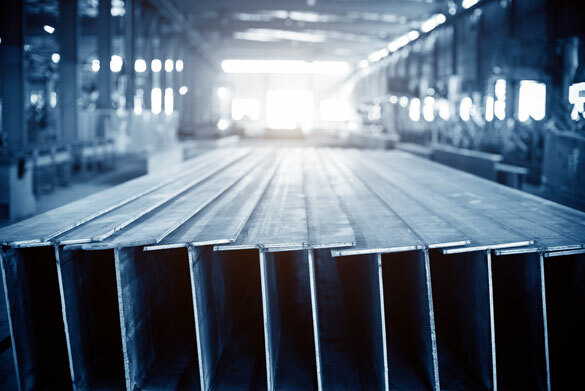 This morning in metals news, the European Commission has extended its probe of steel imports, steel production in the Great Lakes region of the U.S. ticked up last week and Chinese aluminum companies will reportedly come together to discuss falling aluminum prices. The European Commission has extended its investigation into potential remedies needed to address a surge of steel imports on the heels of the U.S. 25% tariff, Reuters reported. The Commission launched a steel safeguard investigation in March and was to conclude in nine months (prior to the announced extension). 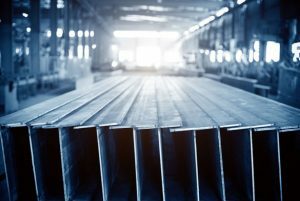 Steel production in the Great Lakes region of the U.S. hit 726,000 tons last week, according to a report by the Times of Northwest Indiana. The production total last week marked a 4.6% increase from the previous week. According to a Reuters report, representatives from China’s biggest aluminum producers will gather to discuss falling demand and aluminum prices. MetalMiner’s Take: A pow-wow amongst China’s top aluminum brass won’t impact the macro trends impacting metals markets. The facts remain, oil prices have sunk, critically falling below $50/barrel, which has moved commodities markets lower. Astute buying organizations know that commodities and industrial metals as asset classes show tight correlation (but not always). Industrial metals as of Dec. 1 remained in a long-term bull trend and a short-term sideways trend. 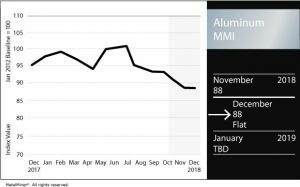 Cutting aluminum production makes sense in markets with weak demand. 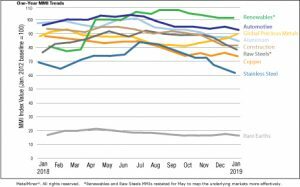 Demand from China appears sluggish, yet it remains unclear if Chinese aluminum producers will show the strength and unity in reducing production.